Alec Haudepin has spent the winters of his youth on the rugby field, and now, at twenty-three, his dream of playing for the All Blacks is almost within reach. But his rise to prominence belies quiet sadness about the part of his identity he has always struggled to acknowledge. Alec Haudepin has spent the winters of his youth on the rugby field, and now, at twenty-three, his dream of playing for the All Blacks is almost within reach. But his rise to prominence uncovers quiet sadness about the part of his identity he has always struggled to acknowledge. "Broken Play captures magnificently the internal conflict and tumult experienced by so many young gay sportsmen struggling to find their true identity. Their sporting world and their attraction to men appears incomprehensible and irreconcilable. 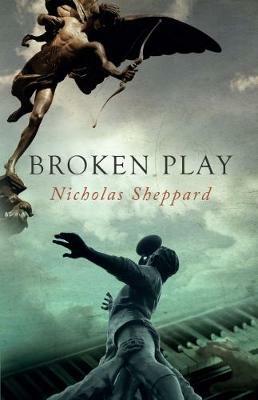 REVIEW - CLAIRE MABEY Broken Play Nicholas Shep-pard (RSVP Publishers, $34.95) When I finished Broken Play, by Nicholas Sheppard, I googled gay All Black . I was so sure I'd come across the name/s that I knew I knew but, due to an unabashed lack of engage-ment with professional sport, had forgotten. The first articles to appear were all, in various ways, about the need to combat homo-phobia in sport in Aotearoa. I was surprised and had to climb out of my bubble and admit that we really are still negotiating what it is to be a male and a male who is also good at sport in Aotearoa. Sheppard's hero is Alec Haudepin, a young rugby star on the cusp of All Black potential. The novel imme-diately illuminates an iden -tity struggle as Alec grap-ples with the logistics and etiquette required for an in-teraction with a female prostitute. Quickly following this scene is one of several flashbacks:Alec comes across his elder brother Mark's body after an acci-dent involving a bicycle and a bridge. The emotional and psychological load on the young man's mind is played out over the course of the story, as his private life and budding rugby career make for hellishly awkward com-panions. This first novel is a smooth read: dialogue is finely crafted from start to finish, while Sheppard's narrative style is fluid and fulsome, with vivid scenes of domes-tic and rural New Zealand contrasting with urban Auckland. At times, the key relationships seem to move a little fast for the sake of plot development. But this doesn't detract much as Alec meets a boy-nextdoor with troubles of his own, Maxim, their relationship becoming the essential development in the book - alongside career-jeopardis-ing incidents with alcohol and drunks in bars, which threaten Alec's credibility with the top men in the pro-fessional-rugby universe. Some of the most insightful moments are the scenes from Alec's secondary school days where he had to contain his true self as it emerged. His enthusiasm and talent for English, en-couraged by a teacher, had to be concealed from team -mates. Alec's fear of being called out for his talent manifested in brute physical intimidation of a classmate suspi-cious of his interest in A Midsummer Night's Dream. Broken Play opens up ques-tions we all still have to ask and discuss. Young men should read it, and older men, too. Rugby players, coaches, management and sports media personalities all need to get a copy and share it. What if an All Black was openly gay and every-one was fine with it? Are we there yet? You'd like to think so, but the reality ap-pears to suggest otherwise. ; NZBOOKLOVERS This original and well-written literary debut is an exploration of New Zealand culture and masculinity. Alec Haudepin is a gifted rugby player who has spent years working towards his life-long dream of playing for the All Blacks. But at the same time his star is on the rise in his rugby career, he is grappling with his sexuality in his private life. When a young stranger, with secrets of his own, moves into his apartment building, he is forced to explore his repressed feelings. But he doesn't want to give up on his dream of being an All Black, and he is conflicted as he wants to be accepted by the rugby community, but he is not sure they will be happy with him being true to himself. Broken Play is a story of a young man wrestling with his identity in the rigid world of professional sports, where men are applauded for being blokey and athletically masculine, but there might not be much scope for moving outside that dynamic. It's a story of love, loss and living. The author cleverly uses the conceit of its main character, Alec, to explore modern New Zealand from many different angles, and Nicholas Sheppard examines what it is to be a man in New Zealand. Broken Play is a fictional work of identity and longing, and the author does an admirable job of creating a believable main protagonist, despite the conflicts in his life. It certainly captures the dedication and sacrifice that are needed to be a professional sportsperson in New Zealand, while also exploring wider dynamics. Nicholas Sheppard grew up in the rural South Island, then moved to Auckland. He has worked as a freelance journalist for local newspapers such as The Herald and The Dominion Post, and magazines, such as Remix; and has written for prominent American news and cultural websites, such as The Federalist, Huffington Post, Politico, and The Daily Beast. He has taught at a private music school, and currently teaches English.